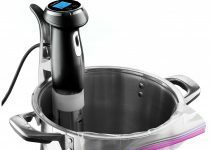 The NutriChef Sous Vide Precision Cooker is one of the better immersion circulators that we’ve reviewed. Let’s take a quick look and breakdown some of its best features. The NutriChef digital LED display and temperature control provide for nice even cooking. Much like its predecessor in the number one slot this sous vide is also very easy to use with its two-button control panel. Again, the power button will turn it on and allow you to select the temperatures. The set button will ensure the temperature stays on your selections. That’s it, now you are ready to spice up your daily meals. The other additional feature the NutriChef comes with is the large cooking pot. This way you don’t have to worry whether or not the ones you have in stock are too big or too small, simply use the pot the immersion cooker comes with for consistently tasty meals. However, if you would like to use another pot you certainly can. We know when it comes to your kitchen you know what’s best and you might have a particular pot you are more partial to using than others. Well, that’s no problem as this immersion cooker is also compatible with standard and large stock pots so you don’t need to use the one it comes with if you don’t wish to. With only two buttons to use, the ease of use of this machine is astounding and something busy moms should utilize well. If you live in a hectic household and have a lot of people to cook for and care for, this machine will allow you to do so without missing a beat. In fact, those who spend more time prepping and cooking will find solace in knowing that this machine can cut down on your cooking time and allow you to focus more of your time on other things. What would this machine be without the cooking pot? Compatible with most large stock pots, you won’t have to go out and buy anything else. In being able use right out of the box, you’re buying convenience in more ways than one. The accurate and precise temperature, along with the easy temperature control allows even the most amateur of chefs to prepare to perfection. Having a tool that allows you to have a high-powered element of heating will ensure that everything is cooked to perfection and people will be raving about coming to your house for events and dinner. Safe and submergible as a precision immersion circulator, this little tool is more than affordable for what it’s worth and provides a plethora of convenience and features. Those who have deep cooking pots will find solace in knowing that this easily attaches and detaches, and allows you to use within the deepest of pots. The built-in thermostat of this device allows for super precise calculations for those who are on the picker side of temperature control (although not a bad thing – it just means the food comes out better!) 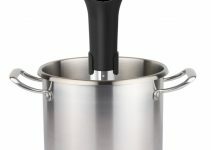 Unlike other products, this tool circulates the liquid in order to keep the optimal temperature for precision cooking. Being easy to use and hassle-free, there’s no reason you shouldn’t invest in a helpful took as such. 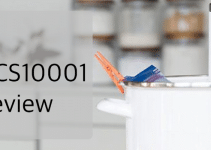 Being able to handle long cooking times up to 60 hours, you don’t have to worry about it sitting and circulating TOO long, and it’s a versatile tool that allows flexibility and longevity of use. The lowest temperature setting on this tool is 32 degrees Fahrenheit; but it’s worth mentioning that it will NOT cool the water, it will just adjust accordingly based on the temperature of the water. A versatile tool, there are a ton of advantages of this product. One of the primary advantages is that you can fully submerge this piece and have it with you for up to 60 hours of the cooking process. There are super simple instructions that come within the contents of this package, and even the most confused of chefs or amateur cookers at home can use this with ease. The versatility in the temperature is also something that should be noted, as it can go down to 32 degrees Fahrenheit. While it won’t adjust the water temperature to freezing, and it doesn’t cool, it’s worth knowing that you don’t have to have it under or over a certain temperature every time. One of the primary disadvantages of this product is that it doesn’t come with a cooking guide, just a user manual. While not a real disadvantage and just something to note for those expecting that out of this machine, it’s worth knowing, but definitely still worth the purchase. Beyond the aforementioned there really isn’t anything negative to say about this tool as it does what it says it does and with ease. Beyond this, it’s quite affordable, as well. Overall, I would highly suggest this inexpensive and highly usable accessory and piece of machinery. With an array of appealing features that assist you in cooking, especially with the sous vide machines, this is also an affordable tool that can help make your cooking that much better. If you want to take your sous vide machine to the next level, I highly suggest looking into this piece of equipment for easy cooking and allowing you to spend more time with your family instead of perfecting cooking without the use of tools. Let’s face it, not all of us have that luxury and anything that helps us to get by is something that’s definitely worth purchasing. Is this product suitable for Singapore usage? We are using 220-240V. Pls advise.